How can I swap positions of two open files (in splits) in vim? 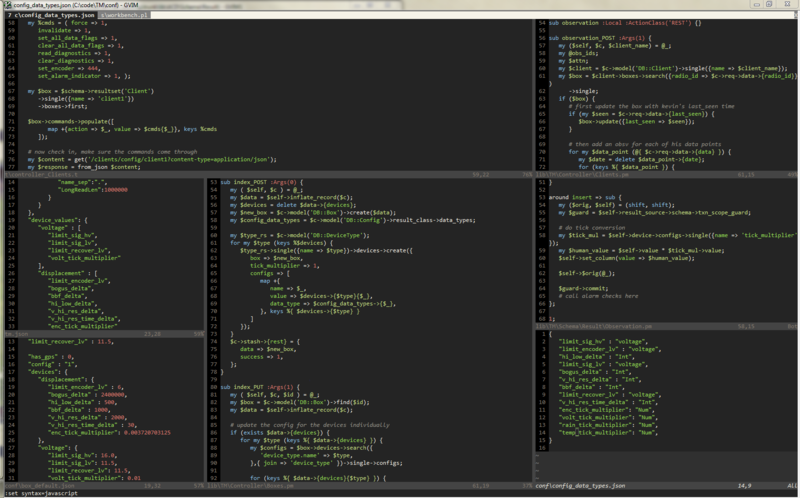 Assume I've got some arbitrary layout of splits in vim. Is there a way to swap one and two and maintain the same layout? It's simple in this example, but I'm looking for a solution that will help for more complex layouts. How could I swap any two of those splits, maintaining the same layout? A bit late to the post, but came across this searching for something else. I wrote two functions awhile back to mark a window and then swap buffers between windows. This seems to be what you're asking for. exe g:markedWinNum . "wincmd w"
exe curNum . "wincmd w"
Voila! Swapped buffers without screwing up your window layout! As you can see, the manouevre is a bit of a shuffle. With 3 windows, it's a bit like one of those 'tile game' puzzles. I don't recommand trying this if you have 4 or more windows - you'd be better off closing them then opening them again in the desired positions. I made a screencast demonstrating how to work with split windows in Vim. Take a look at :h ctrl-w_ctrl-x and/or :h ctrl-w_ctrl-r. These commands allow you to exchange or rotate windows in the current layout. Edit: Actually, this will not work in this situation because it only will swap in the current column or row. You could instead go to each of the windows and select the target buffer, but that's pretty verbose. Randy's correct in that CTRL-W x doesn't want to swap windows that aren't in the same column/row. I've found that the CTRL-W HJKL keys are most useful when manipulating windows. They will force your current window out of its current location and tell it to occupy the entire edge indicated by the direction of the key you press. See :help window-moving for more details. CTRL-W j   # moves cursor to window "two"
For convenience, you can assign the sequences you need to key mappings (see :help mapping). I have a slightly enhanced version from sgriffin's solution, you can swap windows without using two commands, but with intuitive HJKL commands. exe curWinNum . "wincmd w"
execute g:markedWinNum . "wincmd w"
execute curWinNum . "wincmd w"
Please let me know if the behavior doesn't match your expectations. The following approach may be convenient if functions are not available for some reason (f.e. it's not your vim). Use :buffers command to find out id's of open buffers, navigate to desired window and use command like :b 5 to open a buffer (buffer number 5 in this case). Repeate two times and contents of windows are swapped. I "invented" this method after several attempts to memorise ctrl-w-something sequences even for very simple layouts like one-two-three in original question. exe g:markedOldWinNum . "wincmd w"
exe newWinNum . "wincmd w"
Also based on sgriffin's solution, go to the window you want to swap, press CTRL-w m, go to the window you want to swap with and press CTRL-w m again. CTRL-w m is a poor mnemonic choice, so if anybody comes up with a better one, please edit this. Also, I'd like to receive a feedback from the script aka "Window marked. Please repeat on target", however being a vimscript noob, I do not know how to do that. exe s:markedWinNum . "wincmd w"
All of the above answers are great, unfortunately these solutions do not work well in combination with QuickFix or LocationList windows (I ran in this problem while trying to get the Ale error message buffer to work with this). Therefore I added an extra line of code to close all these windows before doing the swap. :echo "window marked for swap"
:echo "window unmarked for swap"
The reason the swap functions don't work properly without removing all the QuickFix (QF) and LocationList(LL) windows first is because if the parent of the QF/LL buffer the get's hidden (and nowhere shown in a window), the QF/LL window coupled to it is removed. This isn't a problem in itself but when the window hides all the window numbers are reassigned and the swap is messed up since the saved number of the first marked window is does (potentially) not exist any more. First buffer switch, window one is filled with the buffer of window three. Thus the QF window is removed since it has no parent window any more. This rearranges the windows numbers. Note that curNum (the number of the secondly selected window) is pointing to a window that does not exist any more. So when switching the second buffer, it tries to select the curNum window, which does not exist any more. So it creates it and switches the buffer, resulting in one unwanted window to be open still. Similar mark-window-then-swap-buffer approach, but also let you reuse last swapping. Not the answer you're looking for? Browse other questions tagged layout editor split vim or ask your own question. How to effectively work with multiple files in Vim? How do I move to end of line in Vim? How do I split a string on a delimiter in Bash? What is vim recording and how can it be disabled? How to exit the Vim editor?